We’re not always proud of our Google history. But if we knew that Ryan Reynolds and Jake Gyllenhaal would team up and answer some of the embarrassing questions we searched? Well, if it was anonymous, perhaps that’d be okay. The two paired up with WIRED for one of the best videos we’ve seen in quite some time. Promoting the movie Life, which hits theaters tomorrow, the two obviously formed quite a friendly bond. Since the movie is already getting incredible reviews, they have a lot to smile over. 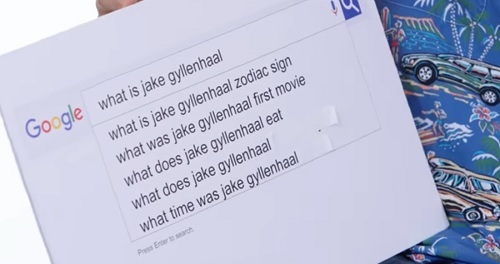 Gyllenhaal and Reynolds let autocomplete control their interview. If you aren’t aware, autocomplete guesses what you might be searching for based on popular searches made by others. We’d love it if it were true, but — alas. It’s not. While Ryan and Debbie both have a ton of acting talent, talent and a last name are all they share. People also thought that Ryan Reynolds and Ryan Gosling might be related, which is even more ridiculous. Really? Gyllenhaal’s questions were a little bit tamer, even though Reynolds tried his hardest to spice up the answers a bit. "Funny you should ask. Baby pandas," Reynolds responded when asked what Gyllenhall ate. Fans were also curious about the tattoos that Reynolds and Gyllenhaal have. Or, the tattoos that people presume they have. While Reynolds was a bit secretive, Gyllenhaal admitted that his body was, as of now, free from ink. And yes — Reynolds did happen to bring up that famous kiss with Andrew Garfield, since of course that was Googled a ton. It’s obvious as to why this video is trending on YouTube. Really, we wish we could get a reality show with these two goofing around. That, or perhaps they can star in every movie together. How about it, entertainment industry?